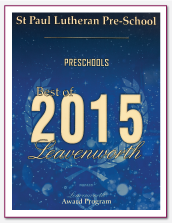 St. Paul Lutheran Preschool has been selected for the 2015, 2016 and 2017 “Best of Leavenworth” award in the Preschool category by the Leavenworth Award Program. Each year, the Leavenworth Award Program identifies companies that have achieved exceptional success in their local community. These are local companies that enhance a positive image through service to their community. These exceptional companies help make the Leavenworth area a great place to live, work and play. 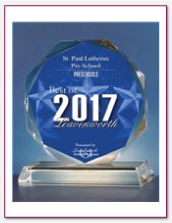 St. Paul Lutheran Preschool is among a very small group of companies that have won the “Best of Leavenworth” award for three consecutive years. 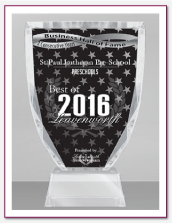 This distinction has qualified St. Paul Lutheran Preschool for the Leavenworth Business Hall of Fame! We require that students entering our preschool class be either three years old by August 31st for our Pre-3 class, or four years old by August 31st for our Pre-4 class. Students entering our Pre-3 & Pre- 4 class must be potty trained. Students entering our 2½ year old preschool class must be two years old by February 28 so they will be 2½ by August 31st. 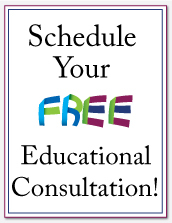 Tuition payments run September through May for current tuition and fee rates: 913-682-5553, or admissions@splcs.org.